Register Now! Develop the "Eyes of a Warrior!" "The Eyes of the Warrior"
Let's begin by asking you a few questions... Okay? Do you possess the eyes of a true warrior? How does the warrior "see" their world? How can you develop this unique and special set of powers? What could you do with your new-found abilities? Who else would benefit as a result of your having learned and attained one of the most powerful, secret, and "invisible" skills leading to true Mastery? Well, if you're serious about learning the true ways of the Warrior, especially of Japan's ancient mystic-warriors known by most as "Ninja," then you won't want to miss this new program by internationally-recognized self-defense expert and Bujinkan master-teacher, Jeffrey M. Miller. This course is the recording of a very special, closed-door, online teleseminar/ webinar (web-based seminar) given to a few of Shidoshi Miller's closest online students, and focuses on one of the most powerful ways that a warrior is different from the average individual man or woman. This includes most fighters, soldiers, and martial artists. During this advanced training program, Shidoshi Miller, one of the longest training students & teachers in Bujinkan Ninjutsu here in the West, will shed light on, and lead you through a little-known subject called the Bushi no Me - the "Eyes of the Warrior." Possessed By a True Master Warrior. ...you will learn everything from how a warrior uses his physical eyes - his actual sense organs - all the way to his connection with what could only be called, "Universal Law" or Shin-Gan "Divine Sight". In fact, the highest level of Mastery transcends even the level of the Tatsujin, something that the Shidoshi speaks on, and to, quite often. NOTE... This course is NOT for everyone! Don't enroll in this course! Then this is a training opportunity that you won't want to miss! You get immediate access to the training course page as soon as you enroll! 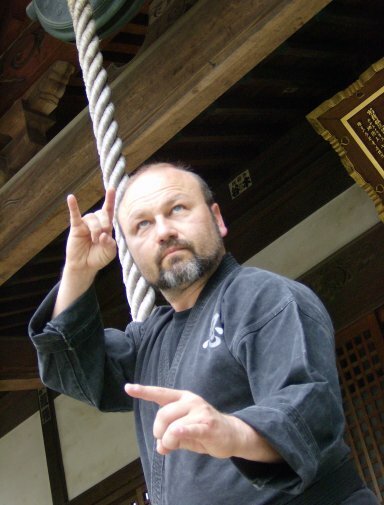 For this one-of-a-kind program with Bujinkan master-teacher, Shidoshi Jeffrey Miller.